Islington N Home & Office Junk Removal | Quality Property Care Ltd. So, maybe it is time to clean out your home, office, garage or loft and make some space for really useful stuff. Book your rubbish clearance and rubbish removal service now! Quality Property Care Ltd. top-notched professional rubbish removal company is available for you despite the type of rubbish you have. We do collect all kinds of rubbish apart from for building materials, leftovers and drugs. Rubbish service in Islington N is optimized in a new excellent modern way to meet your needs without even bothering or making you stand from your armchair. Our service is helpful to your needs, whether you want a one time removal or you prefer scheduling a frequent visit each month or so. For commercial customers we have special machines, with records allowing us to dispose of construction materials like timber, concrete, rebar and so forth. All of our workers are up to standard with certificates and the proper training to complete a job without any hassle or delays. Landlords and property managers get special rates for bulk ordering even during bank holidays and weekends. The service contains domestic services, house clearance, garage clearance, garden clearance, small house appliances, loft clearance, shop clearance, commercial services, furniture disposal, IT disposal, office clearance, construction waste disposal service, tire disposal as well as builders clearance and refurbishment waste disposal. We work with wardrobes, beds, sofas and armchairs, coffee and side tables, bedside, living room storage, cot beds storage, dining tables and dining chairs storage, garden tables, racks and stands, shoe cabinets, dressing tables, chest of drawers, bedside tables,, TV stands and cabinets, shelving units, mattresses,, console tables, bunk beds,desks and chairs,, playgrounds, sideboards, free-standing kitchens as well as modular kitchens. For gardens we remove chairs, barbecue, umbrellas, benches,, hallways shelf, cabinet racks and stands, hangers and hooks, walls shelves baskets and portmanteaus. If you’ve done gardening and have waste that you cannot get rid of of yourself, don't worry, we’ve got your back. We can remove plants and flowers, garden weeds, litter, plastic bags and liners, twigs, leaves, small branches,, animal bedding or straw, Christmas trees, plant containers, plants, pots, glass cuttings soil and turf as well as hedges or hedge clippings. All of this is disposed safely, you will be notified if there are extra charges associated with particular items we are throwing out, before we start the procedure of removal. 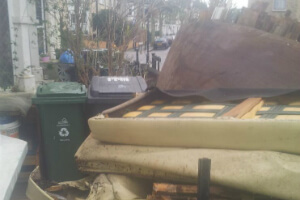 To arrange a rubbish removal service, call 020 3746 4287 or send an online reservation request right now. The client care service is available so you will get your written verification as soon as possible. Reservation involve no deposit, plus the drivers or team will give you the accurate price of the service when they arrive at the spot and can see the volumes, size and type of rubbish which has to be removed. You are not obliged to agree with the price, and will not be charged for sending the rubbish removal party away.